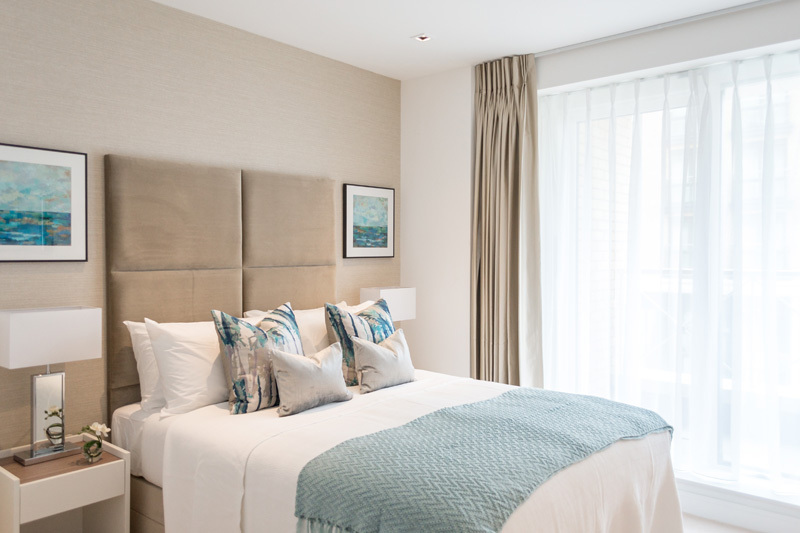 Earlier this year, ani M INTERIORS was approached to revitalise an apartment on Kew Bridge Road for a client who was keen to maximise the property’s letting potential. 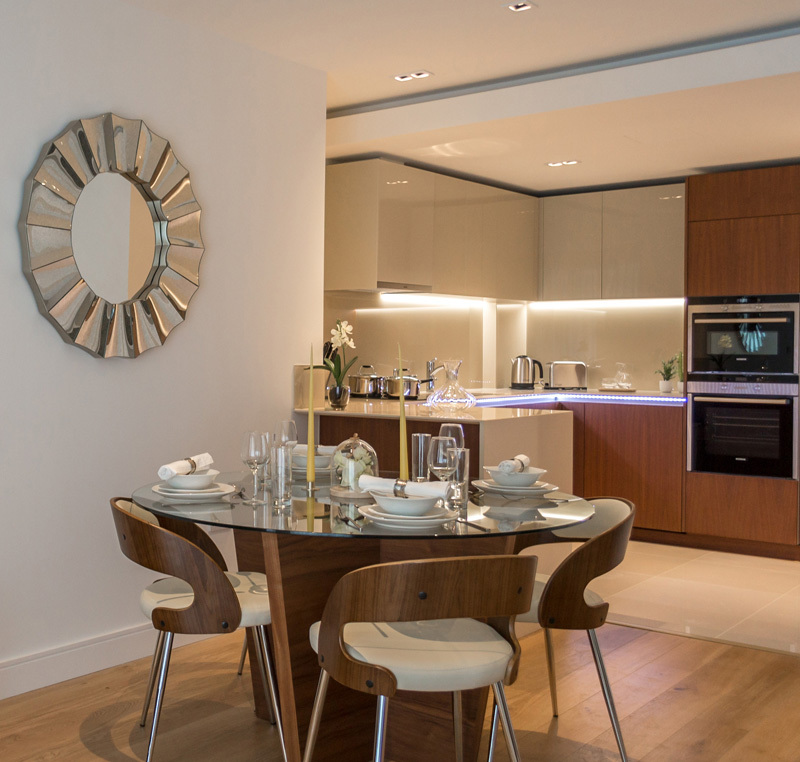 The client had admired the team’s previous work on the St George development and wanted the same fuss-free process and high-end finish that ani M INTERIORS prides itself on. Moreover, the interior design team has an extensive ‘little black book’ of quality suppliers that enables overseas clients, such as this one, to relax knowing that the project is in safe hands. Following a meeting in March to discuss the client’s tastes and requirements, mood boards were created for their approval. The client had a clear idea of the look they wanted to achieve, so following a few minor refinements, the project began in earnest in June and was completed in July. The project comprised bespoke furnishing, wall and window dressing through the two bedrooms, two bathrooms (one of which is ensuite) and an impressive reception room. The client wanted to achieve a warm and inviting home that makes the most of the natural light. The first bedroom was transformed into a haven of calm. A grey, vertical panel headboard draws attention to the recessed wall and is set against elegant grey wallpaper. 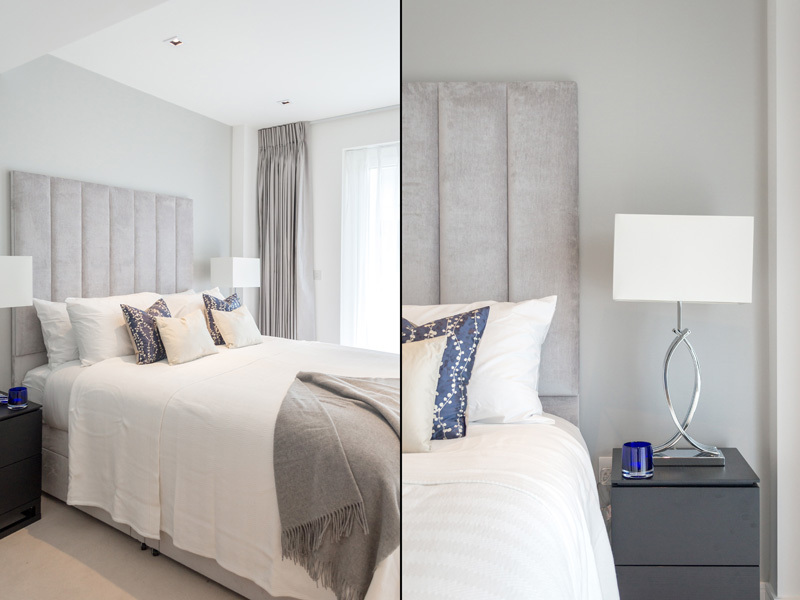 Coordinating grey furnishings, such as bedside tables, help harmonise the space. The grey is soft and inviting, perfect for a bedroom, with accents of white and deep sea blue to invigorate the scheme. White and grey together look crisp and clean, while touches of the blue bring a sense of deep relaxation. Clarissa Hulse’s beautiful, organic patterns in the same blue adorn two cushions that take pride of place on the bed. The team’s use of velvet and silk make for a sumptuous-looking bedroom. The second bedroom makes best use of natural colours, reminiscent of warm sand meeting azure waters. A segmented vertical headboard in a rich caramel is set against textured wallpaper in a paler tone. The same sandy colour is repeated throughout, lifted by accents of white and shimmering blue. The texture and pattern on the throw and cushions stir memories of the sea and it is no coincidence the artwork chosen shows a calm, sunlit seascape. Both bathrooms, standalone and en-suite, were completed with the same attention to detail. Natural wood, marble and white sanitary ware make for a sleek and practical space. The reception room is dressed to impress. Its soothing palate of grey hues is enriched by natural wood and glass furnishings. 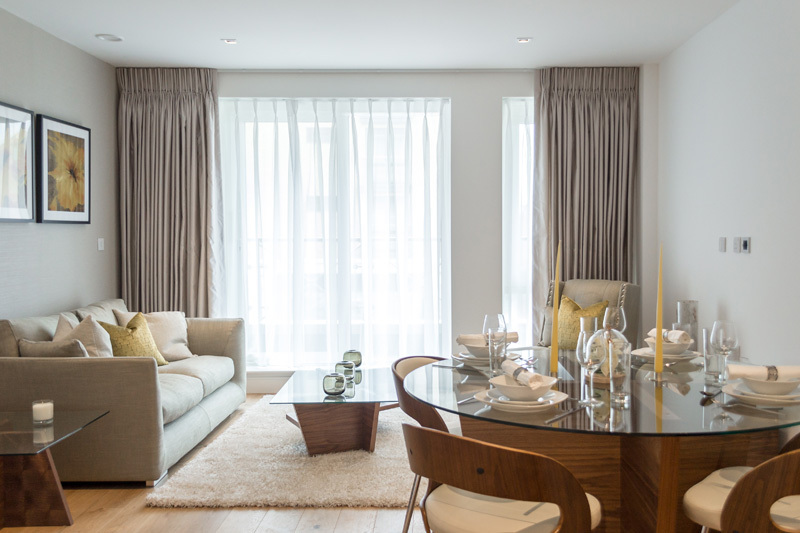 The living space and dining space blend seamlessly with a Nordic refinement that feels cosy in a cooler climate. However, ani M INTERIORS designers have raised the bar further with a clever use of warm yellow. Candles, glassware, artwork and cushions – only tiny touches of yellow but they enliven the scheme without overpowering it. The reception room feels both refined and welcoming, exactly what the client was after. To find out how ani M INTERIORS can transform your space, contact the team today.